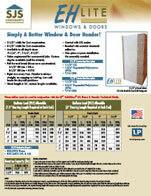 Simply a Better Window & Door Header…Since 2003! Developed to be a cost reducing, time saving, energy efficient window and door header for 3-1/2″ and 5-1/2″ construction. The ExpressHeader is a structural product manufactured with 1-1/4″ APA approved LVL. The LVL material is tested for roof and floor loads, available in 3-1/2″ and 5-1/2″ widths. An Expanded Polystyrene foam core helps eliminate unnecessary wood fiber, allowing you to utilize only what is needed structurally. Stocked length is 16′, custom lengths available. Download the ExpressHeader Flyer (PDF) for more detailed information, including Roof & Floor Load Tables, and Installation Details. Panelizers and Production Builders around the United States are realizing the benefits of the ExpressHeader. Since it’s a one-piece install, the days of building window and door headers are over! Insulate and reduce energy costs for your customer. Insulation value of R7.75 on the 3-1/2″ and R16 on the 5-1/2″ helps achieve new energy codes. 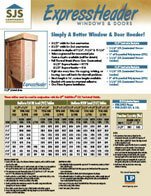 Download the ExpressHeader Flyer for additional installation details.